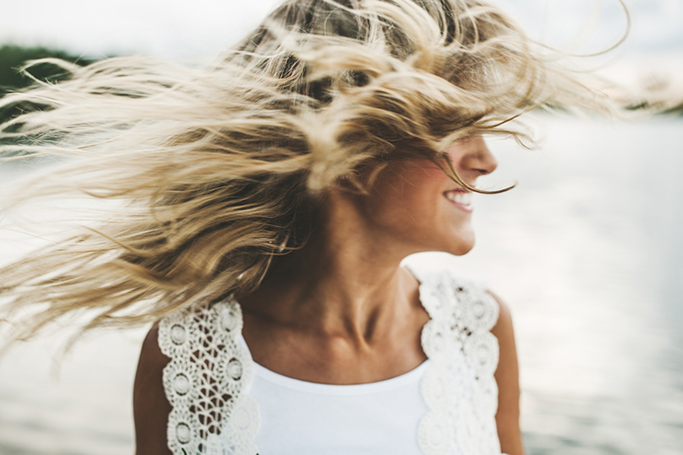 When it comes to sun protection we have our skin covered (literally in SPF 50), but we often forget about our hair and scalp –which can lead to brittle hair and a burnt scalp. Living in a hot climate, it’s especially important to consider sun damage to our hair and adapt our beauty routine to beat the heat in Dubai. Not only does the sun dry out our hair, it also takes its shine away. This is made worse by taking a dip in the pool or sea, as chlorine and salt cause hair to become even drier. Dyed hair is more susceptible to damage, as hair can fade and change from UV exposure. And, don’t even get us started on frizz! Your scalp needs daily SPF –trust us it’s a painful burn you need to avoid, and you don’t want your scalp peeling with the appearance of dandruff. A sun damaged scalp can also prevent hair growth! Luckily you can get protective creams and sprays to help; the Coola Organic Scalp & Hair Mist SPF 30 protects the scalp and hair from UV damage, as the plant-derived extracts condition and moisturizes each strand. The Philip Kingsley Sun Shield is UV proof and also protects from salt water and chlorine. Maintain the moisture in your hair with a weekly mask, the heat leaves hair more porous, so it will absorb the hydrating treatment quicker and more effectively. You can also keep your hair moisturized on the beach with a cream like the Sachajuan Hair In The Sun which has long-lasting UV filter to shield strands and save colour –it also doubles up as a styling cream for that added bonus. The natural oil in your hair protects you from the sun, so don’t shampoo too much and wash it out –it’s a great excuse for greasy hair! Don’t wash your hair every day and instead use a good dry shampoo or a cleansing conditioner like R+Co's ANALOG Cleansing Foam Conditioner, so you don’t strip the moisture from your scalp. Obviously the best way to protect your hair is to cover it up. This summer’s must-have accessory is actually the wide-brimmed hat –so you can protect both your fragile skin and hair from the sun. If you want to be even safer, there are hat brands which have higher UV protection and specially made to shield the sun’s harmful rays.